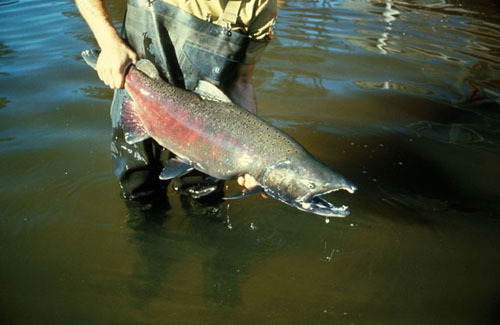 Each fall, many Chinook and coho salmon make their way from the Great Lakes to their birth streams to spawn and die. But some end up on people’s dinner plates. The Michigan Department of Natural Resources (DNR) maintains weirs along several rivers that block the fish and allow for the collection of the fish’s eggs and sperm to help more spawn survive. A weir is an obstruction that is placed across a river and used to catch fish. The eggs that are collected are fertilized, incubated and reared for a year and a half before they’re released. Once the DNR’s egg take needs are met, the agency sells surplus salmon to the public. The fish that eggs are collected from are typically ground up and used for making pet food because their flesh isn’t suitable for human consumption, Switzer said. The DNR’s relationship with American-Canadian Fisheries is highly valued because the department doesn’t have the manpower or the resources to handle all of the salmon, he said. This year, four Northern Lower Peninsula retailers are selling the surplus. The other participating stores are in Brethren, Oscoda and East Tawas. In addition to being fresh, the salmon are cheap, Davis said. A lot of people who buy fillets from him are people who either can’t fish anymore or don’t have the time, Davis said. He picks up salmon two to three times each fall, depending on demand. The bulk of salmon run between mid-September and the first couple of weeks in October, although stragglers continue to come through late October, Switzer said. However, later in the run, the fish are no longer suitable for human consumption. Davis said people come back to buy fish year after year. “I’ve got one person who comes in every year from Detroit and picks up around 40 fish,” he said. “He’ll come with a list and buy salmon fillets for a bunch of people.